From the team that brought you the Time Crisis series comes the GREATEST machine gun shooter in history! RAZING STORM’s stunning System 357 graphics shine in HD on the 60” DLP monitor. Players are fully immersed in the game as INCREDIBLE GRAPHICS combine with 5.1 ch DTS Digital Surround-sound and the new heavy recoil machine gun controller. Digital Surround-sound makes the game louder and more realistic as it separates gunfire, voice commands, background music, sound effects, and bass into different speakers. Like the Time Crisis series, RAZING STORM’s gameplay revolves around the use of the action pedal: step on the pedal to attack, and release it to hide and reload. Link play allows players to team up against hundreds of enemy soldiers, and demolish the FULLY INTERACTIVE environment. Buildings, furniture, windows, appliances, you name it; everything can be destroyed! Some levels even make use of other heavy firearms in addition to the machine gun, such as the cluster shot and the rocket launcher! The ADVANCED ENEMY AI reacts to the style of each player so that everyone has a UNIQUE experience. JOIN SCAR ( Strategic Combat And Rescue)! 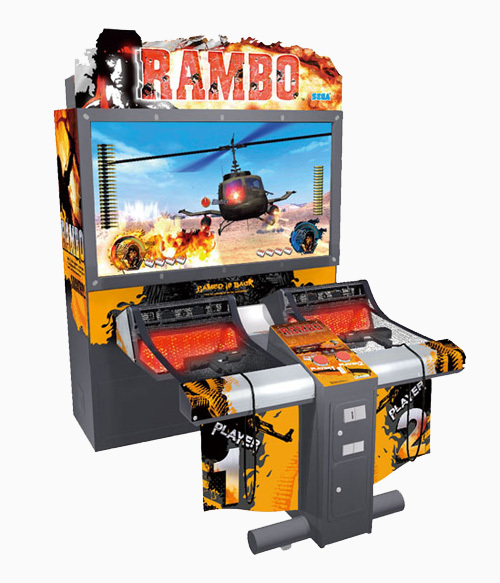 RAMBO is an EXHILARATING shooting game featuring Sylvester Stallone as the main character! Do check out the ENORMOUS 62 inch screen on it's cabinet. Starting with the FIRST BLOOD, RAMBO, as a great soldier, fights the police and National Guard, continuing on into RAMBO where he rescuing the POW’s, the storyline concludes with RAMBO 3 with RAMBO rescuing his abducted friend and former commander. The game features an "RAGE METER" that will pissed off RAMBO shooting power-up mayhem. It is gonna be an ACTION PACKED game! RAMBO IS READY FOR PLAYERS WHO WANT TO BECOME THE ULTIMATE WARRIOR! 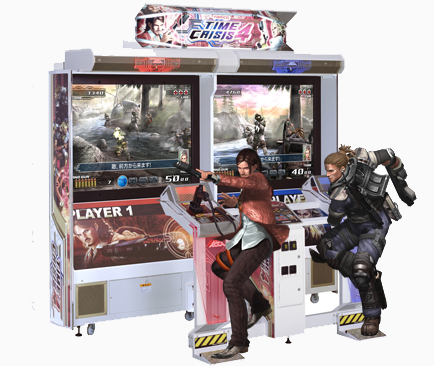 The celebrated pedal and weapon interface returns as TIME CRISIS 4 smashes onto screens in the arcade sector’s most successful shooting game series. TIME CRISIS 4 features System Super 256 cinematic battle sequences, cut-scene and real-time graphics, independent speakers for voice and sound and an improved easy-grip controller for quick, responsive gunplay. TIME CRISIS 4 features an immersive, voice navigation system, which allows in-game characters to talk directly to the player and submerging them deep in a compelling storyline with advice on tactical response and weapon selection. There’s also an arsenal of new weapons ranging from pistol to rifle to machine gun to devastating bio weapon ‘The Terror Bite’. 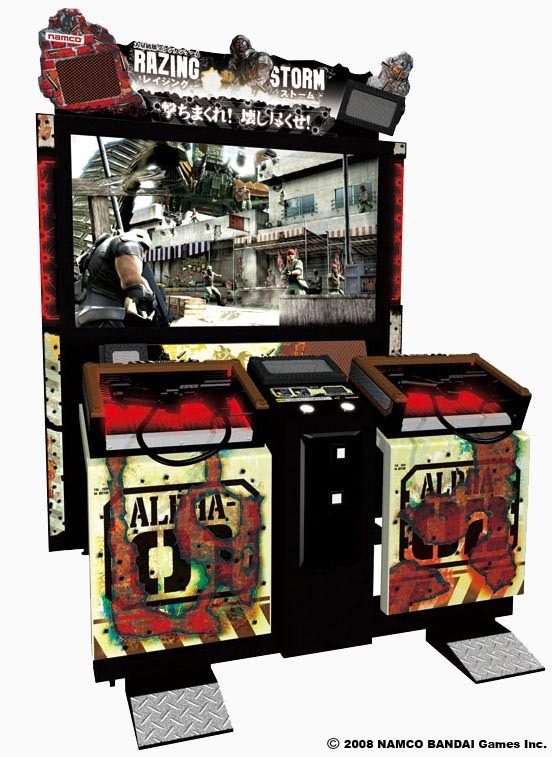 TIME CRISIS 4 is enhanced even further using, for the first time, Multi-Screen Battle technology; players can change their scene perspective and develop their own unique, evolving TIME CRISIS 4 strategy. WILL YOU AND YOUR FRIEND SURVIVE THE AMBUSHED BY A MYSTERIOUS MILITARY FORCE? HOUSE OF DEAD 4 is back! The long awaited fourth edition of Sega's lightgun horrific shooter, set three years after the second game and featuring House of the Dead 2's protagonist, James Taylor (as well as new hero Kate Green) as the battle untold horrors from your imagination. 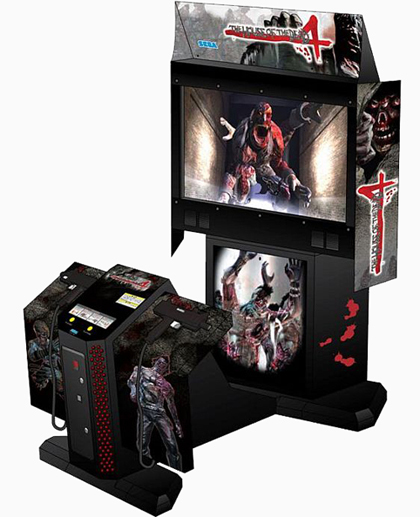 In this edition, the power of next-generation gaming hardware is used to create masses of attacking zombies to blast through. The lightgun controller features a new motion sensing feature to allow players to shake off zombies when they grasp the player. SO ARE YOU ABLE TO ESCAPE THE CLUTCHES OF THE DEAD?? ?